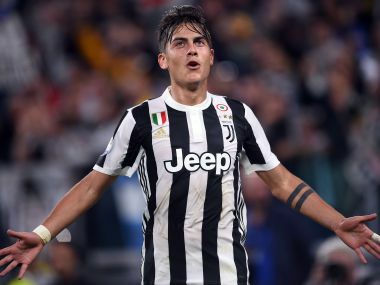 Milan: Paulo Dybala scored a double as Juventus outclassed 10-man Torino 4-0 in Saturday's Turin derby to stay top of Serie A alongside Napoli who battled past SPAL 3-2. 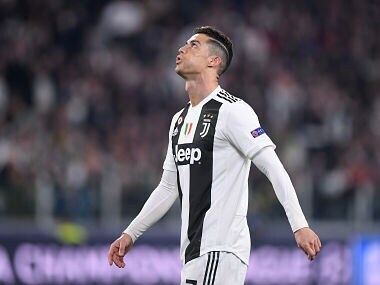 The Argentine striker has now scored an impressive ten goals -- including two hat-tricks — in six Serie A games with Miralem Pjanic and Alex Sandro also on target at the Allianz Stadium. Juventus kept their perfect start but for Torino it was a first defeat of the campaign as they struggled a man down for over an hour after Daniele Baselli was sent off for a second yellow card. "Torino usually cause problems for their opponents, but we were never under threat tonight," Pjanic told Mediaset Premium. Earlier Napoli came from a goal down to beat SPAL 3-2 for their sixth win in as many games as AS Roma cruised past Udinese 3-1, to give all of Italy's Champions League contenders confidence boosts ahead of next week's action. Maurizio Sarri's Napoli are ahead of the champions on goal difference with 22 scored with Roma moving up to fourth on 12 points and Torino drop to sixth with 11. 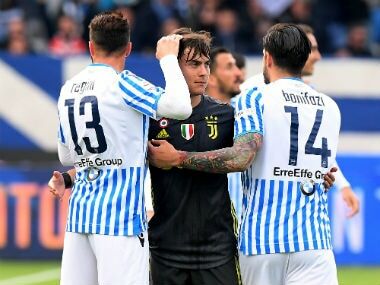 Dybala opened the scoring after 16 minutes from the edge of the box following great work by Pjanic to win the ball off Tomas Rincon in midfield. A Pjanic free kick five minutes before the break gave Juventus their second with Sandro heading in the third after 57 minutes. Goalkeeper Salvatore Sirigu did well to deny the hosts more but could do nothing to stop Dybala's fourth in stoppage time leaving Torino waiting for a first victory at Juventus since 1995. 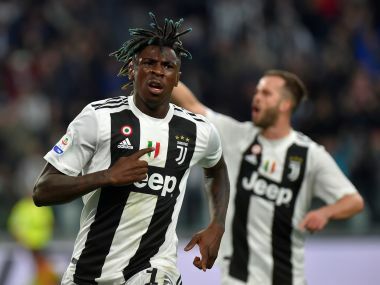 Despite their Serie A run Massimiliano Allegri's side lost their Champions League opener 3-0 at Barcelona and next host Greek champions Olympiakos on Wednesday. “The team will give a response at home, as we want to get through to the next round," warned Pjanic. "Olympiakos have quality, so we must try to dominate from the start and put the pressure on straight away, as we did tonight." Despite sitting 15th in the league SPAL proved to be more than a match for high-flying Napoli. Pasquale Schiattarella opened on 13 minutes for the hosts but just a minute later Lorenzo Insigne had pulled Napoli level. In a dramatic second half Jose Callejon headed in on 71 minutes for Napoli before Federico Viviani curled a free kick over the wall to make it 2-2 for SPAL six minutes later. But Faouzi Ghoulam sealed victory on 83 minutes with a great solo run from midfield. "They created some problems, but we were good at staying united and believing until the end," said Insigne. Napoli next host Feyenoord in Champions League action Tuesday bouyed by having scored 22 goals in six championship games. Earlier Italian forward Stephan El Shaarawy scored twice after Edin Dzeko's 12th-minute opener, as Roma, with a game in hand, move up to fourth. Coach Eusebio Di Francesco said he was delighted that the pieces were beginning to fit into his jigsaw after early criticism of his tactics. "I see the lads are ready to do what I ask," said Di Francesco. "El Shaarawy is an ideal forward for my system. "I can't help but be satisfied with my team." Luigi Delneri's visitors were struggling from the outset at the Stadio Olimpico with Dzeko on hand for the opener and his sixth goal of the season after Radja Nainggolan pushed his way through a porous Udinese defence. Dzeko rolled in a cross for El Shaarawy's first after half an hour with a blunder by Udinese's Danish defender Jens Stryger Larsen giving the player nicknamed 'The Little Pharaoh' his second just before the break. Stryger Larsen got one back after his earlier misfortune scoring a consolation goal in the final minutes. It was a confidence-boosing performance for Di Francesco's side ahead of their midweek Champions League trip to Qarabag in Azerbaijan.